Canon Powershot 14.1MP Camera w/ Tripod, 8GB Memory Card, Card Reader, Case, Tripod + More: $99 w/ Free Shipping! WOW, this is an awesome bundle deal! 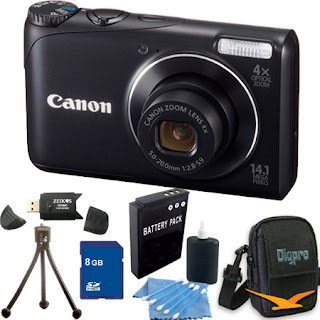 You can get a Canon A2200 Powershot 14.1MP camera, mini tripod, 8GB memory card, card reader, battery, carrying case and more for just $99.00 with free shipping. Here's where the deal part comes in...the cameras ALONE have a retail price of $139.99 on Canon's site and costs $79.99-$94.95 on Amazon! This camera has pretty decent reviews. Click here for more info on the camera itself. To see the bundle deal, just click on the color links above!